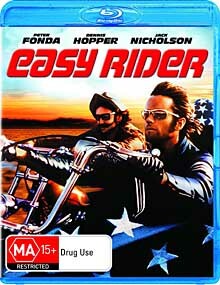 I have just received the Blu-ray version of Easy Rider from Sony Pictures Home Entertainment. Thanks Sony! One immediate and obvious difference from the DVD: this disc is rated MA rather than the M at which my DVD copy is rated. IMDB reports that it was re-rated in 2009. The ‘MA’ label says ‘Drug Use’ by way of explanation. Meanwhile, movies that used to be rated ‘R’ for violence back in the 70s have been downgraded (eg. ‘MA’ for Dirty Harry and The Good, the Bad and the Ugly). Funny how standards change over the years. Update (2 February 2011): I’ve added the pack shot for this title. Last night I ripped frames from both Blu-ray and DVD, and I plan to do a comparison soon. This entry was posted in Blu-ray, Cinema, DVD. Bookmark the permalink.